The new Phiaton BT 390 Wireless Headphones combines the latest wireless technology with epic features & sound all within a compact design. Bluetooth 4.1 provides improved sound quality and efficient wireless streaming. Long battery life offers up to 30 hours of non-stop music playing time. 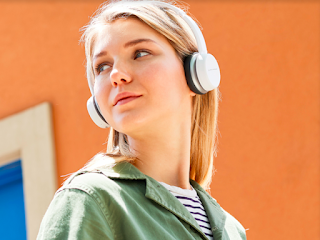 The Phiaton built 40mm drivers feature an optimized vibration system, adding extra emphasis on high frequency, while oversized Neodymium magnets provide a rich, commanding bass. Padded ear and head cushions offer a comfortable fit for extended use, while the fold and go design make these small headphones ideal for commuters and frequent travelers. The versatile BT 390 is equipped with on-ear controls and microphone for the wireless handling of music and phone calls. For added convenience while on the go, Multipoint technology simultaneously connects any two Bluetooth-enabled devices, and Everplay-X technology keeps the music going even if the headphone’s battery runs out, or the audio device is not Bluetooth compatible. My Opinion: I really like how easy these headphones are used in to place on your head not to mention the fact that they are Bluetooth as you can listen to music and also answer calls with this. The clarity of voices and music is impeccable and these will make a great Christmas gift for anybody along with having 30 hours of nonstop playtime until it needs to be charged again.